Looking for some solid entertainment over the holidays? Why not catch up on some great TV: For a limited time, Hulu is offering a selection of popular television shows for free for all Android users of its app here in the United States. Unlike past “free episode” mobile promotions, this Hulu promo features shows you likely already watch. Fans of the show South Park will be happy to see its most recent episodes are available, as are a number of classic episodes from past seasons (like Make Love, Not Warcraft). The selection from other shows is more limited – you’ll find the most recent episodes of Law and Order Special Victims Unit, The Mindy Project, Family Guy, Brooklyn Nine-Nine, Sleepy Hollow, Nashville and more. The pilot episodes of other favorites like It’s Always Sunny in Philadelphia and The X Files are also available, as are shorter clips from shows like Late Night with Jimmy Fallon. 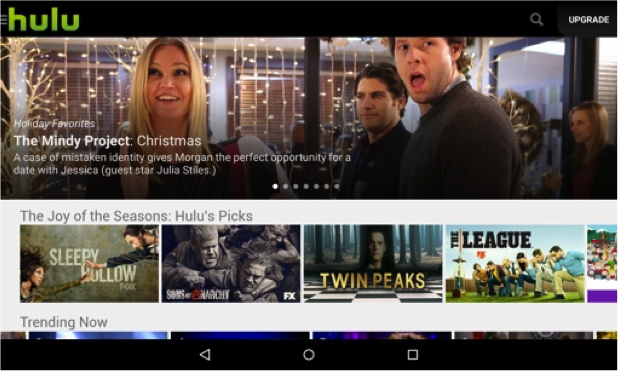 Android users aren’t getting full access to Hulu for free – you’ll need a $7.99 per month Hulu Plus subscription to unlock all the shows and episodes available for mobile streaming. There are no freebies this year for users of the iOS Hulu app. Thankfully though, there’s no shortage of content available elsewhere for Apple fans. Episodes of South Park, The Colbert Report, and The Daily Show with Jon Stewart are available for free through the Comedy Central mobile app, even without a paid cable subscription. You can also get access to plenty of other channels’ apps with a pay TV, including ESPN, TBS and even NBC. And while you’re at it, use our ScreenBeam line of products to beam this content and more to your TV for full-sized entertainment.